The unexplained is often the most fascinating. Humanity, even with the erudite science base of today, doesn't hold near enough knowledge about the extremities of space and what they're capable of. On top of that, we also have little grasp on the capacities of the brain, considering that we use very little of the byzantine material occupying our cranial cavities. Andrei Tarkovsky's Solaris weaves together those mysterious veils and drapes them atop a tale of intellectual conquest and the demons of one's past, peering at a space station positioned above a foreign planet that shows signs of intuitive, mystical life within gyrating waves and billows of fog. Yet the obscurity that envelopes the handful of scientists populating the station isn't something explicitly solvable, much like the curiosities of physiology and environment; instead, it explores the cosmos of expression and communication, concocting a haunting rumination on science and the mental psyche as the living planet enigmatically touches those nearby. Tarkovsky adapts the early-'60s novel from Polish writer Stanisław Lem, which arrives late in the exploration of the mysterious planet Solaris. Many years have been spent toiling away trying to identify the hints of organic life within the celestial body, the subject of debates over the course of many years that followed the scientist Burton's testimony. The project, however, has reached a critical and highly unstable juncture, a point where it seems the researchers will have to take drastic and potentially damaging measures to continue the work: either expose the planet's ocean to highly irradiated material, or close up shop completely. Scientist and psychologist Kris Kelvin (Donatas Banionis) travels to Solaris to survey the current situation, yet what he discovers on the eerily empty, melancholy station reveals that the planet has been having a profound effect on the psychological -- and physiological -- state of the crew, creating acute manifestations of people from their past that live and breathe among them like living beings. Those familiar with Andrei Tarkovsky's work know that the Russian director composes his shots methodically and with little brevity, getting wrapped up in slow-moving tension and emotional swelling while shifting glances among scrupulously-composed set design and enraptured close-ups. Solaris is no exception; he starts his science-fiction contemplations by glancing upon water-bound vegetation and a galloping horse, the stillness in the air luring our attention towards the calm serenity of Earth, almost as a gentle reminder before the events that follow. Even then, once the lens focuses on Kris surrounded by the wispy beauty around him in a field, there's a foreboding energy that fuels a sense of unease, intensifying as Tarkovsky seamlessly injects mild science-fiction curiosities into this time on Earth -- talk through video screens that's annotated by blue-filtered cinematography, an interesting bubble-like transport between Earth to the space station, and the eclectic sounds of the future themselves. At first, we follow Kris to the space station in hope of receiving answers, leaning on a natural compulsion to have the gaps filled in our awareness of the alien planet's mysterious nature. The bloated, bureaucratic board meeting of bickering scientists does a crackerjack job of sparking our curiosity, with the concerned words of an aged, balding, and disturbed scientist juxtaposing against recorded footage of his testimony from many years prior. 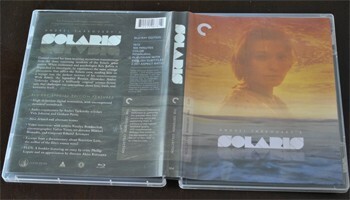 Solaris, however, isn't interested in offering answers to why the planet exists, explicitly why humans should continue researching it, and why the hallucinations occur; Tarkovsky composes his adaptation with the proper amount of obscurity as its backbone, letting the unanswerable nature of the phenomenon becomes its own guiding force. Instead of responses to inquiries of origin and reason, it merely becomes a validation of the riveting vagueness that's led to years of aimless but vital research, reflecting on both the vainness and credence of diligently examining something that ultimately cannot be answered by tactile means. The realization of the Solaris space station itself is still, to this day, extraordinary in its subtlety and haunting design through Vadim Yusov's cinematography, along with the resolve behind the sensory reactions generated by it. From when we see the floodlights once Kris Kelvin arrives in the central bay and witness his slow stroll through the circuit breakers -- eying the dirt and debris littered about as if the station's abandoned -- it sets the tone flawlessly for the still-aired, evocative mood created upon realization that the observation station has turned into an unstable zone of phantasms and mental instability. Premeditated stretches of silence and faint sound effects permeate Tarkovsky's meditative warzone, and it creates a pensive stillness that facilitates our own reflections on how we'd stomach seeing loved ones long past manifest before our eyes. Naturally, alongside that, the sloped hallways and idyllic purity of the bright, almost ethereal lighting give it an other-worldly presence. Has the Solaris space station become something of an ether plane between realities while poised above the planet, or does the serenity merely reflect the mental state that the planet's cocooned the doctors in? Solaris becomes a contemplative science-fiction examination instead of a methodological one, bearing witness to how this living, breathing planet alters the perception of less-evolved mentalities and how it digs into their memories and psyches in a foreign fashion. As Kris acclimates himself to the space station and, soon, quickly begins to experience his own lucid visions, in the form of his beautiful dead ex-wife Hari (Natalya Bondarchuk), the film swiftly refocuses on the internal demons gnawing away at the scientists, without even tippy-toeing towards an explanation. Really, though, the fact that these men are scientists almost becomes irrelevant, aside from their purported investment in the nature of discovery itself. Their mania -- if you want to call their erratic yet somewhat euphoric state that -- becomes a philosophical arena for their discussions about the interactions they have with the hallucinations, with their grasp on science working as both an anchor to keep their perceptions grounded and as a base of intelligence that acknowledges a need to embrace the wonders of it. The crucial vertebrae supporting Tarkovsky's magnum opus can be viewed in the conversations between the foolhardy but brilliant scientist Kris Kelvin and his deceased wife. These are melancholy, soul-searching reflections over the nature of their existence on the station and the power that resides on the planet Solaris, as well as glimpses into tender moments that can be seen as the lost talks between two souls who weren't able to express their devotion in the physical life. The insistence of Hari's presence around Kris -- no matter how falsely he may see her as an apparition or materialization of his mind, all due to the unexplainable life force stirring underneath them -- plunges deep into poignant reflections on our obscured, rigid perception of communication with other living beings, neither malicious or benevolent, provoking an overpowering mixture of philosophical consideration and almost hypnotic empathy with Kris, his strife for discovery and psychological constancy, and the demons of his past. One of the last shots of Solaris, where the scientist watches over the writhing visage of his wife, shapes all these considerations into a downhearted, devastatingly cathartic collision of sensations that's astonishing to behold. Once again arriving as Spine #164, The Criterion Collection have brought Solaris to the high-definition arena in their standard clear-case Blu-ray packaging with new artwork, which fittingly depicts the ethereal nature of Hari's face against the churning waves of the planet. 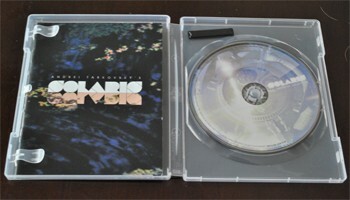 A Booklet has been included that offers credits and descriptions for the film's scanning/rendering process, while also replicating the essays from the standard-definition presentation: "Tarkovsky and Solaris", by Akira Kurosawa, and "Inner Space", by Phillip Lopate. The cinematography in Solaris remains some of the most beautifully captured science-fiction material ever committed to film, between the subtle gyrating fluid of Solaris' surface to the cold, soft, metallic corridors that shape the pathway that Kris and the other scientists walk through. The Criterion Collection have stricken this high-definition master on their Spirit Datacine from a low-contrast print made from the original 35mm negative, and the results within this 2.35:1 1080p AVC encode are nothing short of astonishing. There's naturally a heavier level of grain that's inherent with the film stock, and a thicker level of dust and debris can't be touched up within close-ups and dense background pieces, but the level of detail, filmic presence and clarity will truly shock in this ravishing visual rendering. 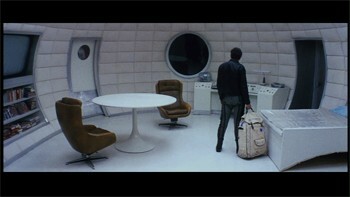 Tarkovsky uses a focused but rich palette here that plays with soft blues, tans, yellows, and silvery sheens, following Kelvin through the open, suitably-lit hallways and to his minimal but visually intriguing room on the station, all of which are supported with nimble contrast awareness and a succulent sense of palette coolness and depth. Simple elements -- like the darkness of chic leather bucket seats to the translucent beauty of a stained glass door -- show off an incredible grasp for the cinematography's aims, while the density of the technological circuit boards and the grandness of a rocket launch area support a wealth of intricate textures and slight palette shifts. The delicate flutters of light against Hari's crinkled shirt late in the film, the waving of foliage early on, and the eye for detail in the costume work delivers on all cylinders. In short, it's nearly everything that Solaris really could be visually, through a tremendous effort from Criterion that allows their reputation to persevere. Silence is even more of an importance as the preservation of sound in this monaural Russian PCM language track, stricken from the 35mm optical track positive at 24-bit. The amount of subtle clarity present in this high-definition audio track impresses during the time on Earth, grasping at the aged but crisp sound effects of a horse neighing, the passionate chats between scientists, the rush of rain that coats the country cottage, and the brusque effects of driving through a busy mildly-futurist city. On the space station, the musicality and sonic bits are implemented strategically and with complete awareness of a still sensory mood, which the aura treatment preserves with nary a hint of hiss or distortion at any given point. Dialogue remains rich and involving, though still withheld by the age a bit, while the slight crinkling of rigid plastic and the mix of subtle and heavier musical cues ring quite true. Criterion's common usage of only English subtitles accompany this release. 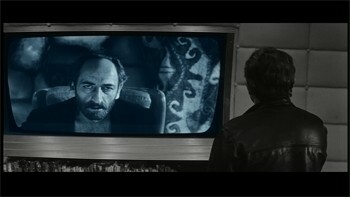 The pair of Tarkovsky authors goes to great lengths in this commentary to analyze and expound on the thematic context coursing underneath the director's science-fiction film, dissecting our perception of cinematography and the Solaris station's influx of supplies to the shifts in tone during Kris and Hari's conversations. They elaborate on the usage of sepia and other color filters throughout the picture, Kris' cold-bloodedness upon how he first "deals" with Hari, and how cutting to images of weather reinforces some of Tarkovsky's emotional construction. The track itself leans more towards technical, textbook-style exploration than a sense of personality and energy about the discussion, but the material covered within continuously offers both interpretive and tactile exposition on the film's construction. Here, the actress who played Hari offers a candid interview about how she grew to work with Tarkovsky, discussing how he saw something special in her that he hadn't seen in many other auditioning actresses. She talks about her "sly" maneuvers in getting Tarkovsky to see her footage by way of Larisa Sheptiko, connecting her director father's talents to the way Tarkovsky works, and reveals anecdotes about things that unfold while shooting -- including a few intriguing bits about her potent writhing scene late in the film. Since she's a filmmaker herself, she knows the right topics and points to discuss, which makes for both a insightful and faintly tender reminiscence. Tarkovsky's regular cinematographer elaborates rather in-depth about the visual fabric created in Solaris for this interview, discussing textures, the churning of water, and things that the mind can't quite grasp. He reveals a great deal about specific scenes and their production elements while discussing how he filmed them, such as the rocket launch sequence and capturing the exterior station itself, while darting to discussion about Tarkovsky's other films intermittently -- especially Andrei Rublev. He also talks lightly a bit about the filmmaking struggles in Russia. But the most interesting bits of this interview come in his exploration of the scenes he and Tarkovsky shot, which are passionate yet technical. Art director Romadin dives straight into how he met Tarkovsky and Vadim Yusov, describing his situation at the time a little bit and the impression he had on the Golden Lion-winning director when they were first brought together. He also talks a bit about his contribution to Andrei Rublev and how it tied to him being invited to work on Solaris. He discusses his aesthetic eye and how it incorporates with the science-fiction content, as well as production hiccups that caused trepidation around the adaptation, and how Romadin suggested overhauling -- and downscaling -- the visual tone of the space station. It's a passionate and insightful talk, one that compared Tarkovsky's visual ton to other great auteurs and explores the nature of their association. Like the other interviews, composer Artemyev recalls his first experience in meeting Tarkovsky, mentioning his nervous demeanor while the pair met over drinks. He then delves into the way he mixed the sound and insisted on specific themes and subthemes in the musical energy. He also discusses Tarkovsky's resistance in coming to the sound studio and the strange anticipation over whether the director would use bits and pieces he'd pieced together. Rounding out Criterion's supplements, a series of nine Deleted and Alternate Scenes (25:01, HD AVC) offers glimpses into Tarkovsky's original, untrimmed version of the film, along with a video excerpt with the source material's author, Stanislov Lem (4:57, 4x3 HD AVC). It takes something special for a piece of science-fiction cinema to remain captivating over a span of forty or fifty years, both in its relevance and its aesthetic conceptualization. Solaris does just that, and with effortless poise. While Andrei Tarkovsky's orchestration of the haunting space station and its "enlightened" scientists remains current on a visual level, the power pulsing within its exploration of our communicative restrictions, the presence of complex celestial life, and the perseverance of scientific exploration gives it a universal weightiness that likely won't lose its mesmeric capacity for quite some time. But on top of that, it's also a gorgeous exploration of the demon's of one's past and a philosophical glimpse at the concept of life's essence. It's not easy stuff to absorb, and Tarkovsky takes his poetically-composed time in exploring it, but it's hard to find a more rewarding foray in sci-fi than this. The Criterion Collection continue their steady stream of impeccably-crafted high-definition upgrades with Tarkovsky's film, offering the entrancing cinematography and mindfully-orchestrated sound design through an enormously satisfying, eye-widening Blu-ray experience that soars above its previous rendering. Along with an fascinatingly detailed commentary and a cluster of lengthy, in-depth interviews, all of which have been replicated from the two-disc DVD, it's about as essential of a Blu-ray as you're likely to find. DVDTalk Collector's Series.